With the increasing globalization, new office space is being developed which is pushing the demand for office furniture. Office furniture at present shares 15% market of the total global furniture market. There is tough competition among the market players over the furniture quality, installations, extended warranties, portability and multi-functionality and the price of the furniture. Thus, office furniture manufacturers and the vendors are coming up with various innovations leading this market to grow substantially. 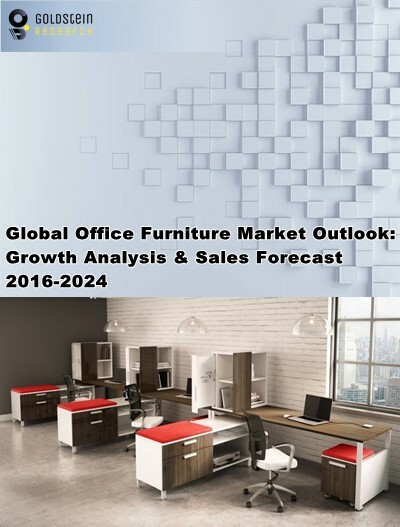 Goldstein Research analyst forecast the office furniture market size is set to reach USD 96.2 billion by 2024 from the current USD 61.2 billion, growing at a CAGR of 5.8% over the forecast years. The growth of the market is driven by the price, quality and technology of the office furniture. The report covers the present ground scenario and the future growth prospects of the office furniture market for 2016-2024 along with the statistics of the total shipment of office furniture. We calculated the market size and revenue share on the basis of revenue generated from major players and sales of office furniture and products from major players across the globe. On the basis of products, there is the high demand for the office chairs having the market share of 13.9% in 2016 which includes swivel chairs, stacking chairs, ergonomic chairs and benches due to the necessity of the comfortable working conditions. In the distribution channel segment, the use of online platforms is increasing gradually and shifting form offline platforms for the distribution of the office furniture in order to cater the larger segment of the customers worldwide. Office furniture market outlook 2016-2024, has been prepared based on an in-depth market analysis from industry experts. The report covers the competitive landscape and current position of major players in the office furniture market. The report also includes porter’s five force model, SWOT analysis, company profiling, business strategies of market players and their business models. Global office furniture market report also recognizes value chain analysis to understand the cost differentiation to provide competitive advantage to the existing and new entry players. According to the report, major driving factor for the growth of office furniture market are the increase in construction activities and rise in office spaces such as in India, Brazil, China, and more. Thus, the development of an economy of a region drives the demand for the requirement of office furniture. Further, the major challenge for the office furniture market is the competition from the local players, whose furniture which is cost effective for the customers and they provide better facilities during the customization of office furniture as well as the after sale services, which becomes difficult over the online platforms. Based on geography, North America accounts for biggest market share of 33.21% in 2016 of the global office furniture market followed by the Europe and Asia-Pacific. North America has a huge demand for office furniture owing to the requirement of more office spaces and construction activities as per the economy. Asia pacific is an emerging market for office furniture due to emergence of new companies and high investments on the construction activities by the different economies, which is experiencing 4.1% y-o-y growth from 2016-2024. Global office furniture market report comprises of the following companies as the key players in the office furniture market: Herman Miller, Godrej and Boyce, Kokuyo, Okamura, Steelcase, Berco furniture solution, Creative wood. Other high-flying vendors in the office furniture market are: Stellar Global Furniture, Kimball International, Meridian Office group, Technion, Wipro Furniture, Sedus, Kinnarps, HOF Furniture. What is the total market size by 2024 and what would be the expected growth rate? What is the revenue of office furniture market in 2015-16 and what would be the expected demand over the forecasted period? Who all are the key vendors in this market space?